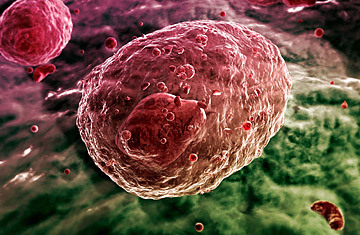 Can a Bone-Marrow Transplant Halt HIV? The human immunodeficiency virus (HIV) is a pathogen so wily and protean that researchers rarely talk about curing infected patients, focusing instead on treatment and prevention. But in an announcement that caused a flutter of excitement and a wave of prudent skepticism, Berlin-based hematologist Gero Huetter claimed on Thursday that he has cured an HIV infection in a 42-year-old man through a bone-marrow transplant. Is this a viable cure for HIV? Not by a long shot. Even Huetter says bone-marrow transplants, which kill about a third of patients, are so dangerous that "they can't be justified ethically" in anything other than desperate situations like late-stage leukemia. Nor is it clear that Huetter's claim to have cured his patient is yet justified. HIV has a frustrating ability to hide in hard-to-detect "reservoir" cells in various parts of the body. Current antiviral drugs, for example, can lower a patient's "viral load" to the point that HIV is undetectable in his or her bloodstream. But as soon as such patients are taken off antivirals, the virus comes storming back. Huetter's patient has not received antivirals for two years and remains virus-free even in the known HIV hiding spots of brain and rectal tissue, according to Huetter's tests. But many researchers remain skeptical about whether these tests have been thorough enough. Dr. Andrew Badley, director of the HIV and immunology research lab at the Mayo Clinic, told the Associated Press, "A lot more scrutiny from a lot of different biological samples would be required to say it's not present." Rob Noble of the British AIDS charity Avert says recent setbacks for research into an AIDS vaccine, along with multiple false hopes in the search for a cure, have caused many in the HIV activism community to view Huetter's experiment warily. For many AIDS activists, bone-marrow transplantation is a loaded procedure that evokes a traumatic past: before antivirals were widely introduced in the 1990s, it was one of the aggressive and often fatal procedures doctors tried in their desperate effort to halt the epidemic; some of these transplants even used marrow harvested from baboons. In light of that pessimism about curing HIV in patients, Huetter's announcement was barely discussed at a major international HIV conference in Glasgow today, according to Fakoya, who was attending the event. He said greater attention was paid to more prosaic methods of defense, such as early identification and testing programs. "I'm in the conservative camp  I don't think there will be a cure," he says. "But if you look at antiviral treatment, data was provided at this conference confirming that you can live 30 years on [antiviral-drug] therapy, especially if it's initiated soon after infection. We are getting to a stage where HIV can be managed as a chronic illness. Now, that's not great, but I have a feeling it's the best we can do for the foreseeable future." See pictures of the AIDS crisis in Africa. See TIME's A-Z Health Guide.